If you've visited GavsWorld.net because you have received some SPAM e-mail, this is nothing to do with me or this website. Basically, every so often some dirty spamming bar stewards spoof e-mails as being sent from GavsWorld.net. The ones I've seen bounce back have random letters, e.g. xsfgtwap@gavsworld.net. I've discovered that this is a common occurrence for people that own domains and unfortunately, there is nothing at all I can do about this. 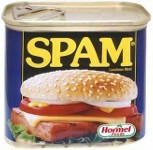 These people generally cannot be traced, but If I could get hold of them, I'd castrate them with the jagged edge of said Spam tin and no anesthetic!